Mobile social communication is beginning to take center stage as the internet moves to real time communications. The recent explosion of interest in augmented reality is part of a wider concern to orchestrate a new landscape of contextually relevant information linked to location/place/time and mobile social connectedness. Last month, I attended three events starting with MoMo #13, Amsterdam, where I presented on, “The Next Wave of AR: Mobile Social Interaction, Right Here, Right Now!. Then I caught the last two days of the Web 2.0 Expo, NYC, and finally, Real Time Crunchup SF (which I watched online). New forms of real time mobile, social connectedness were central themes on all three occasions. 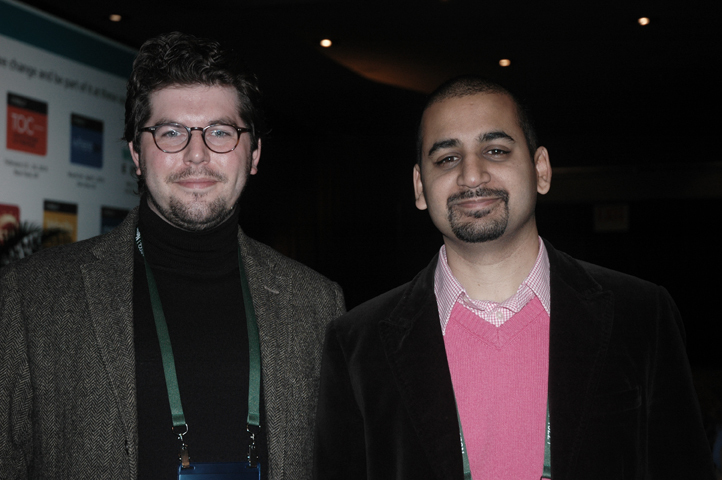 But, in terms of doing stuff that matters with mobile real time technologies, at the moment, we are still at the “hello world” demonstration (see my conversation below with Anil Dash and Mark Drapeau at Web 2.0 Expo below). Tim O’Reilly has committed to Gov 2.0 work and “doing stuff that matters” with missionary zeal (see his keynote Web 2.o Expo, War for the Web). Tim O’Reilly’s talk, also the article, War for the Web, are a stark reminder of how the centralization and privatization of large parts of our communications infrastructure threatens the open web. But “doing stuff that matters,” as it turns out, is one of the best ways to win the war for the open web. The Gov 2.0 movement is still in the idea and initiative phase, but the ideals and scope of the movement are a natural antidote to the fox in the social network chicken coop business model du jour (see the latest antics of Zynga). One of the most challenging aspects of creating in context mobile applications that do stuff that matters is the data curation. 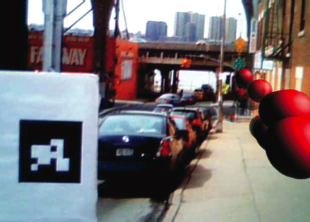 Sean White, explained to me at ISMAR 2009, the challenges of data curation behind this beautiful example of augmented reality doing something that matters (pic below) - a pollution meter, that “shows carbon monoxide levels projected over New York City. The height of each ball reflects concentrations of the pollutant” (developed at Columbia University Graphics and User Interface Lab where Steven Feiner is Director). Note Sean White and Steven Feiner will be at AR DevCamp NYC this weekend at The Open Planning Project office (TOPP) – see below for more information. Open Data combined with Open Architectures of Participation are a Powerful Combination. Scott Yates commented in his very insightful post on RT Crunchup SF that a “literny of fixes” for a broken web were “presented as the state of the art” in a “series of presentations from companies that have solutions that fix some subset of all the long list of annoyances” (annoyances arising from finding data and friends locked into a variety of different walled gardens). I have been working on a project to create an open distributed augmented reality/mobile social communications framework based on the Wave Federation Protocol. This Saturday Dec 5th there will be AR DevCamps held in Mountain View, New York City, Wave and Skype. There will be sessions on many aspects of open augmented reality, including Wave enabled AR. I will attend AR DevCampNYC at the NYC location, The Open Planning Project office (TOPP) penthouse in Manhattan. This will be an awesome opportunity to meet some of the key augmented reality thought leaders and innovators, including Sean White, Steven Feiner, Steve Henderson, and many others (see the sign up list here). Ohan Oda will demo the open Goblin XNA platform. Thomas Wrobel will answer questions on writing AR Blips to PygoWave Servers and Sophia Parafina (@spara), Joe Lamantia (@mojoe) and I will be on hand to discuss the open distributed framework for AR project - Wave enabled AR. The PyGoWave crew will participate via skype (they will be introducing some of their latest work ). Ori Inbar of Ogmento and Games Alfresco will lead a brainstorming session on the “Big AR NY Game”: The first location-based, social, augmented reality game designed for New York by New Yorkers. We will continue the interesting discussion led by Marco Neumann (@neumarcx ) on the Semantic Web and Augmented Reality at the Semantic Web Meetup. John C. Havens will introduce the Outernet Guidelines Initiative. And Matthew Snodgrass @mattsnod, Lippe Taylor will lead a session on the future implications of AR. Noah Zerkin, will share his brilliant work on AR software and hardware interfaces and exploring the idea of an AROS. And Kate Chapman, from Washington, DC, @wonderchook, and a bevy of local NYC geo geniuses, including organizer Sophia Parafina (@spara ), will explore ways to visualize government data through AR. 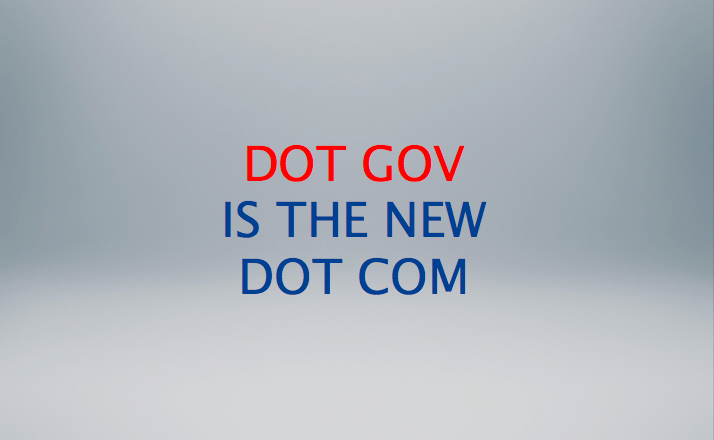 I am hoping we will have some projects for the upcoming Gov 2.0 Expo at http://gov2expo.com. And there will be much, much more – keep checking and adding to the wiki. See you there! 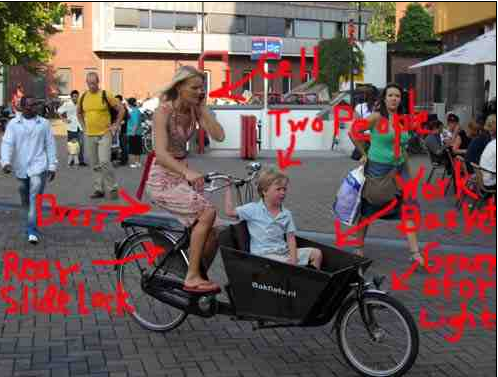 But my visit to MoMo #13 preceeding the Web 2.0 Expo showed me clearly “hacking human behavior within a city” is on home turf in Amsterdam, where smart phones and bicycles are the vehicles for the MoMoesque lifestyle. Thanks to the foresight and generosity of the MoMo organizers, who make sure that the experience of the speakers together goes beyond the few hours of the event, I had a three day, three night intensive on the future of mobile social interaction – living, thinking, and breathing mobile social connectedness, often into the wee hours, with Dennis Crowley, CEO of FourSquare (see his great MoMo 13 presentation here), Ted Morgan, SkyHook (a must see presentation on what SkyHook is doing with data), the MoMo crew, and many of Amsterdam’s enthusiastic Four Square community. But what do fun times in Amsterdam and FourSquare have to do with doing stuff that matters? Dennis Crowley, seemingly immune to lack of sleep and jet lag, followed up his MoMo #13 talk with a presentation at Web 2.0 Expo. I was sitting just behind Mark Drapeau, and I managed to catch up with Mark after Dennis’ talk. “I think Foursquare is a good model in terms of having a game dynamic, being mobile from its default, having a great social experience, leveraging existing networks like Twitter and Facebook instead of trying to compete with them by building their own. I think those are all really, really smart leanings. Tish Shute: I was in Amsterdam speaking at MoMo#13 and I had a lot of fun hanging out with the MoMo crew and Dennis, CEO of Four Square. 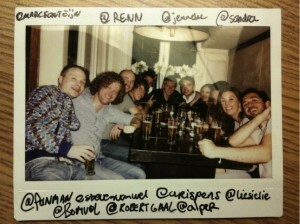 I got to meet people and hang out with Amsterdam’s new Four Square community. But unfortunately I missed the first two days of Web 2.0 Expo. Mark Drapeau: I got here yesterday too. Yeah. So some big takeaways. I had always been a little leery of trying FourSquare because I have a certain level of privacy I try to keep up. 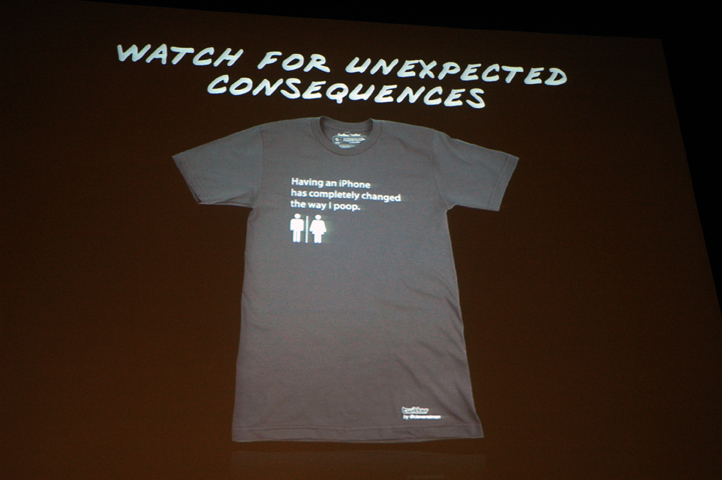 But listening to the CEO of Foursquare talk about it… I knew what it was. I have friends that use it but thinking about it as hacking human behavior within a city and social engineering of peoples’ behavior and what they can do, and really understanding what citizens are doing within cities, or other areas, and how they interact with each other, I think that could be incredibly valuable for government 2.0 and government understanding people better. Also I really wanted to hear Tim O’Reilly interview Beth Noveck. I thought the most interesting thing about the interview were the questions and not the answers (also see Mark’s Posterous ). I thought a lot of the answers were disappointing and political and vague. But I thought Tim really got some important issues about how do people in the web 2.0 community, the audience of Web 2 Expo, interact in reality when you have a system that we nicknamed Gucci Gulch, where you have lobbyists and lawyers and special interest and councils and all these things that…developers and app builders are not really a part of. So how do you break in? I didn’t really hear good answers for that. I really liked the presentation by the IBM researcher, if I can get his name. Forgive me. Ching Yun-Lin. Talking about putting a value on how many friends you have, how many connections you have and the fact that IBM can actually put a monetary value on the number of connections you have to managers. The number of email accounts you have in your inbox. Or your address book. I thought that was just fascinating and that’s something I’m very passionate about is social networking for the sake of social networking and not merely for collaboration but making connections among diverse communities and using that to help your business or help your government agency. Those are my big takeaways this morning. Tish Shute: I was lucky enough to attend Gov 2.0 Summit. I think a lot very important areas for Gov 2.0 were defined there, transparency, open data, getting developers into the public sector loop, and citizen-government interaction. In what areas are we seeing progress and where are we stymied and why? How do you see this Web 2.0 community connecting to the ideals and plans for action of Gov 2.0? Mark Drapeau: I think there’s a lot of unanswered questions about Government 2.0 because there’s a lot of good talk and a lot of good ideas and initiatives but there’s still a long way to go before people in this audience, in this community who want to help the government or be a part of policy making or technology in the government can really in a meaningful way, interact with the government processes that, for the most part, are not going away. And the people that are also part of the system, like giant contractors, they’re not going away. There’s a place for everyone. The question is how do the smaller people break in and I don’t think there are really great answers for that. Tish Shute: What is the plan for the next Government 2.0 event? Mark Drapeau: So part of the reason I’m here is to learn and be inspired as the co-chair of the Government 2.0 Expo next May that O’Reilly and TechWeb are also producing. And so there’s increasingly at the Web 2.0 events that they host, there are technologies and people relevant to government missions, or the public sector missions. And so I think some of the speakers here will carry over in different ways to the Gov 2 Expo in May. 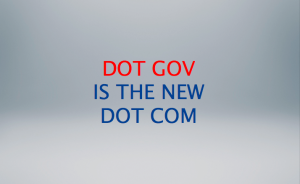 Tish Shute: Is the call for proposals for the Gov 2.0 Expo still open? Mark Drapeau: There’s still an open call for proposals. Or people, if they know me they can talk to me directly. (Anil Dash arrives and Mark introduces me (Anil and I met briefly at Gov 2.0 Summit) – see Anil’s post, New York City is the Future of the Web I do agree but, of course, NYC is my hometown!). Tish Shute: Anil you are moving into Gov 2.0 work full time now after being a key thought leader in Web 2.0. Anil Dash: My perspective is probably unique in that I am very strongly from the Web 2.0 world, and new to the Gov 2.0 world and I think it’s telling that you can make the leap. I think that the profound thing is that these worlds are converging and it’s not where it was. Now we have have institutions that have wonderful physical presences. You can’t stand in front of the Capital Building or the White House or Supreme Court and not say “that’s a majestic building.” We should have online institutions that reflect the scope and the scale of what they do. For me, in starting Expert Labs it’s been great just to tap into the desire people have to help and serve and to take the idea that you can work for your country without having to work for your government. What can you do to participate? Tish Shute: You and Mark had very interesting journeys into Gov 2.0 didn’t you? Tish Shute: I like that! Anil Dash: Can you say that about yourself? Anil Dash: People were feeling it..
Tish Shute: And even if it’s controversial it’s good too! I see Mark (and perhaps I am wrong with these characterizations) as coming to this via an interest in the social narratives of government and, Anil, you have come to Gov 2.0 work, as you point out, from a deep immersion in the cultures of technology and Web 2.0…. Anil Dash: And it’s also a little bit, I’ve had the privilege of seeing blogs and social media develop from the start and what I learned from it is cultural change and [not just] technology change. This is the same thing happening in government. We’re calling it Government 2.0 and it makes it seem like it’s a version upgrade and it’s a software thing but it’s cultural change. And the interesting thing is many of the key players have a willingness to go through that cultural change, which means that the technology, therefore, has the opportunity to succeed. 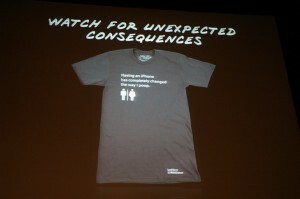 Tish Shute: What did you think about Tim O’Reilly’s keynote and the warning he gave re the open web? Anil Dash: The war for the web! He’s absolutely right. Honestly, before Expert Labs had started and I’d come on board, my initial plan for a talk at this event was exactly the topics Tim covered in the War for the Web. That the centralization of vast parts of our communications infrastructure around privately owned, venture funded companies is a risk to innovation in some ways. We have to make sure to set up our incentives for those companies, the Facebooks and Googles and Twitters of the world, to align with what our goals are as a society, as a culture, as entrepreneurs, and all those other goals. So I think it’s good to have a voice like Tim’s articulating that threat and that danger so that we can respond to it. I agree completely that we are in the next phase of the battle between open and closed platforms that we went through ten years ago with AOL. There was a time when AOL dominated more of the dial up internet, one-third of all dial-up users in the US were coming through AOL. People now say “oh, the iPhone is dominant.” The iPhone has 2 percent market share of all phones or something like that, and yet people are doing all their innovation on their platform. Well, people used to do all their innovation on AOL’s platform and then they ended up having to rewrite it all for the open web. This pattern is going to repeat. The choice is whether people want to encourage it or fight it or hope it goes away and ultimately there’s no great business that was built entirely within the walls of AOL’s garden. I doubt there will be a great business built entirely within the walls of Apple’s or Facebook’s or anyone else’s garden. That’s not to say those companies couldn’t evolve to be open, I hope they do, but as it stands right now you would be foolish to bet your business either from a promotional standpoint, from a start-up standpoint, from a new technology standpoint, on any closed platform that you don’t control. Tish Shute: I was mentioning to Mark that I thought it’s sort of ironic that we now understand how important the architecture of participation of the internet can be to government just as we are on the verge of another big battle to keep the web open…, a moment when walled gardens are seeming to dominate..will this be an obstacle for Gov 2.0? Anil Dash: No I think actually they’ll get to skip the closed era. You know I look at the rather famous example in India of never having landlines. They went directly to satellite phones, skipped directly to the wireless generation so they never had an old infrastructure to rip out. I think you are going to see the same thing with government tech adoption is they are going to start in the era of recognizing the threat of closed platforms and move directly to open platforms. Because government has an inclination to creating openness by its nature. Right? We don’t have an entirely toll system of federal highways in the states. We understand that the broadcast airwaves are a public good. And so government is inclined to think about creating public goods. It would be ridiculous to spend tax payer dollars on funding proprietary platforms. Mark Drapeau: Universal accessibility for citizens. Anil Dash: Right. It’s a fundamental tenant of government and we have an incredible history including the Internet itself, of embracing open standards to solve government problems in a way that helps all of society. Tish Shute: So people who have championed open participatory architecture of the internet and open source approaches now have even is more incentive to team up with government 2.0! Anil Dash: Yeah it is an advantage. But also, I mean candidly, open source is almost incidental to it. I mean I think we have come to the point where open source is assumed as some element of any new tech venture. It is much more about level playing fields, open access, open APIs, controlling our data, being able to move with it, that I think is key. And I go back to that AOL example, there was a moment where they opened their email gateways to standard Internet email. And so instead of the AOL users only being able to email each other, they could email anybody on the web and this is the moment in which all the value was created. You start to have email marketing companies, and open exchanges and open mailing lists happen when anybody could email anybody else, that is the sort of thing that government catalyzed just by being the example. Tish Shute: Mark talked about Four Square and how that could be really interesting as part of a Gov 2.0 project. But mobile has followed a course with many complications re an architectural participation – I am thinking about the control exerted by the carriers and now Apple for example? Anil Dash: No, I think it has revealed complications that have always been there. Right? There’s always been multiple platforms. There have always been user agents and web browsers that have different capabilities. There has always been a digital divide. Mobile is making clear that those realities existed. But I keep saying this, like, I think if I am designing an application today, you design for mobile first, for a number of reasons. One, the digital divide is much less pronounced on mobile devices. Two, you are much more likely to have an experience that scales well from a small device to a larger one than vice versa. Three, you are able to target international markets or other developing markets where mobile is the default computer platform. And you become aware of constraints in bandwidth, in accessibility, in user experience, in general experience with computers, that a lot of people in the technology industry just completely ignore. And you know you go to Silicon Valley and people think it’s normal to have a six hundred dollar phone that has a thousand dollar a year data plan. And without blinking they designed for devices like that. It’s myopic and ridiculous to think that people can live with that level of privilege all the time on all the devices that they have and that they have a brand new computer. And so that will be its own undoing. Right? It’s the people that are thinking about open platforms and working with any device and I think FourSquare candidly is doing a good job of this because they did start with the assumption of iPhones and this thing but their initial target audience of hipsters in the east village probably did have those. But now they have an open API, anybody can access it, that’s the right evolution. And I think they’re smart enough, that was always on their plan. Tish Shute: But in terms of mobile social interaction we basically have really a structure all of lots of different wall gardens? Tish Shute: How do you see mobile developing more interoperability and social interaction capabilities? Anil Dash: By using the web. I think it doesn’t have to be full-fledged Ajax-y, html applications on the phone. But if we simply rely on the capabilities of the web as it stands today instead of developing for proprietary mobile platforms we can make a lot of amazing things happen. It’s a good constraint. We should embrace our constraints. It’s not conventional wisdom yet that mobile applications should be developed for the web. But that’ll change in the next year. Tish Shute: There is a lot of exciting new real time technologies coming to the Web, Pubhubsubbub, Google Wave Federation Protocol. How will these change mobile development? Anil Dash: RSS cloud. I mean there’s a ton of real time technologies that are coming out together. Tish Shute: What are your favorites in the real time area? Tish Shute: Oh yes great post! Anil Dash: I don’t pick a favorite. I think all of them together will work. I think it’s similar to how the web itself evolved. We have a tangle of different related technologies that get abstracted away when you use a browser. You don’t know if it’s a gif image or a jpeg image when you browse a page. You just know it’s showing an image in line. Tish Shute: Mobile seems like a vital part of government 2.0 because it can connect people and their government to their context/public infrastructure/environment that is a shared concern. The open data movement has shown that being able to mash up data and get that delivered in context is a very powerful kind of technology for government 2.0. Right? Anil Dash: I remember five years when Adrian did Chicagocrime.org. It was a revelation but I mean, that was five years ago. And people still keep making that app over and over. I remember at the time I had just become friends with Craig Newmark and I said, “Craig’s List should show the crime around the neighborhoods where you have an apartment listing.” And he said, “Well, if I do that then neighbourhoods that are getting better, that historically had more crime, will never improve because people won’t rent apartments there.” And he came back with that answer immediately as soon as I suggested the idea and revealed one, why Craig’s List is the success that it is. But two, what the implications are of releasing data and having to think about the social implications of that. Anil Dash: Right. Exactly. We have to think about the social implications of the tools and technology we create. That means that the reason…one of the reasons we have only had these, frankly, unambitious obvious applications of open data is because the people that have had access thus far have been people that are not socially oriented. Like geeks are very inwardly focused. Tish Shute: Oh. Okay. Well Mark’s changing this..
Anil Dash: They’re in a very insular community. Mark Drapeau: I think there’s a number of people that are trying to change that. Anil Dash: Yeah. It’s starting to change but I’m saying that’s why we’ve seen that symptom in the past. Mark Drapeau: I get a lot of mileage out of the fact that I’m neither sort of a career govie type that’s getting into the 2.0 stuff. Nor am I a lifelong techie who’s getting into the government and stuff. I’m sort of…I’m interested in these anthropological, psychological, animal behavioral, ecological questions about human behavior and networking. And that’s where I kind of come into this. Anil Dash: And I think we’re going to need an ethnographic approach to looking at how people work with this data in their real lives. People are using this data already and don’t realize it. You know, when we grab a map in an unfamiliar city you’re using government data. We just don’t think of those behaviors as doing so, and we need to understand that to build applications that really solve people’s problems. Tish Shute: So can you speculate on the next generation you’d like to see? Anil Dash: I think Foursquare is a good model in terms of having a game dynamic, being mobile from its default, having a great social experience, leveraging existing networks like Twitter and Facebook instead of trying to compete with them by building their own. I think those are all really, really smart leanings. I think about if I were a government agency trying to meet those same goals, could I earn badges in Foursquare by doing things that help my community. Right? So when I volunteer at a soup kitchen is that one way to earn an exclusive badge? Is that going to earn me a discount at the bar? Those are all dynamics that we can set up very, very easily and I think that model…maybe it is a public-private partnership. That’d be great. Mark Drapeau: Or even doing things to help your internal community. Key people at work or within your agency or things like that. From my vantage point it does seem like local Government 2.0 types are thinking much more about mobile than the Federal government types. The reality is government employees all have BlackBerries and they’re running around all the time. But they’re in terms of government 2.0 type stuff they’re thinking about the Dell desktop they have and the Microsoft Windows system and whenever I mention something like mobile or pervasive videos…..people aren’t really there. They’re worried about cyber security on the traditional systems. They’re worried about desktop applications on a Dell. Anil Dash: They’re still five years ago. Mark Drapeau: Yeah. They’re still five years ago and so I think these kind of O’Reilly-Tech Web events, Gov 2.0 Expo, Web 2.0 Expo, etc., are really starting to get at these questions that are now and not five years ago. Great post! I just shared this over at http://www.socialfeds.com.